Mauritius is going to host the 11th World Hindi Conference (also known as the "Vishwa Hindi Sammelan" in the Hindi language). The event be organised by the Government of Mauritius & the Ministry of External Affairs, Government of India. 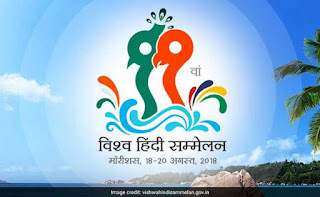 The Ministry of External affairs organises the World Hindi Conference every three years. This 11th Conference will float the theme of "Vaishvik Hindi Aur Bharatiy Sanskriti". The event will be held from August 18 to 20, 2018 at the Swami Vivekanand International Convention Centre in scenic city of Port Louis, Mauritius. To provide a much needed platform to numerous scholars, writers and laureates of Hindi language from all over the world to lend their much needed contribution to this Indian language. To discuss the Classical as well as the Modern elements of Hindi language. To layout guidelines for promoting Hindi as language of globalisation given its increasing use by India at the United Nations. Emphasize on the global reach of Hindi through movies and appreciate the role of Bollywood in that. To sum it up, the aim of organising this event is to bring an increase in the popularity of Hindi language, globally. Participants, including guests and delegates, can be registered only through an online process. The registration fee for general participant in Rs. 5,000 and for students, it's Rs. 1,000. The last day to register is July 15, 2018.